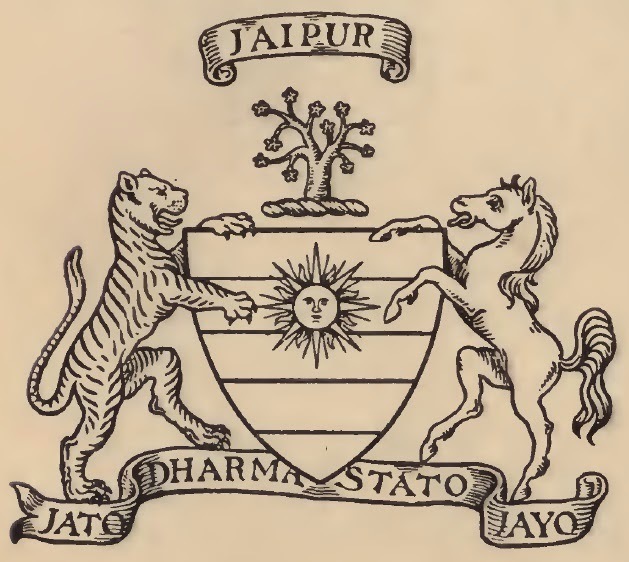 JAIPUR, HIS HIGHNESS SIB MADHO SINGH BAHADUR, G.C.S.I., Maharaja of. Arms. Barry of 5, gules, vert, argent, azure, or; in chief a Sun in its splendour. Crest. A kuchnar tree proper, bearing cinquefoils argent. Supporters. A tiger and a white horse. Motto. "Jato Dharma Stato Jayo". Source : The golden book of India, a genealogical and biographical dictionary of the ruling princes, chiefs, nobles, and other personages, titled or decorated, of the Indian empire, by Lethbridge, Roper, Published 1893.